Background: Application of transannular patch (TAP) during the repair of tetralogy of Fallot (TOF) leads to the development of pulmonary regurgitation (PR). This PR is known to cause right ventricular (RV) volume overload and dysfunction which in turn leads to increase in both morbidity and mortality both in immediate and long-term periods. Here, we sought to analyze the effects of polytetrafluoroethylene (PTFE) pulmonary bicuspid valve on the early outcome of patients with TOF repair where TAP is needed. Subjects and Methods: This is a retroprospective, observational study where PTFE bicuspid pulmonary valve was incorporated in all consecutive patients undergoing repair of TOF involving the application of TAP. Postoperative inhospital course was assessed, and patients were followed till 6 months for the status of PR and peak RV outflow tract (RVOT) gradient. Results: 38 patients were enrolled in the study. The mean age of participants was 53.66 ± 78.67 months. Extubation in operating room was done in 31 (81.58%) patients. 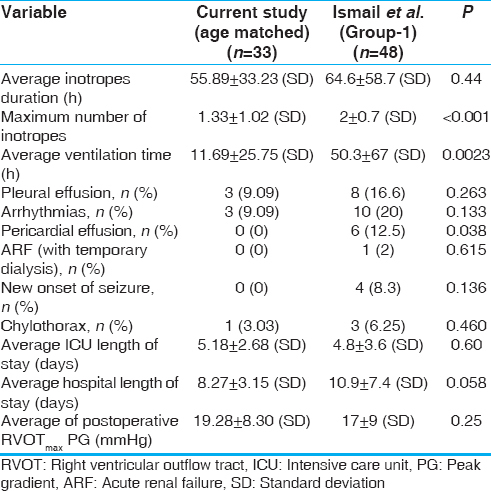 Duration of ventilator support was 10.48 ± 24.22 h, and duration of hospital stay was 7.95 ± 3.08 days. These data were compared with three recent studies where only TAP was applied. Extubation in operating room, mechanical ventilation time, and hospital stay were significantly improved in the present study. Out of 37 live patients, four (10.81%) patients had no PR, 28 (75%) had mild, 1 (2.7) had moderate, and 4 (10.81%) had severe PR. Average RVOT peak gradient was 18.8 ± 8.1 mmHg. Conclusion: Incorporation of PTFE bicuspid pulmonary valve during the repair of TOF appears to facilitate early extubation and thus reduces ventilator-associated comorbidities. Study needs further long-term follow-up to look for behavior of PTFE bicuspid valve. Several strategies have been tried to minimize the PR,, with the intraoperative use of valved conduits, pericardial valves, polytetrafluoroethylene (PTFE) monocuspid valve, and PTFE bicuspid pulmonary valve. The use of valved conduits has disadvantage of lack of durability, lack of growth, and valvular dysfunction. The use of pericardial valve has failed to prevent the development of PR. Use of PTFE monocuspid valve has shown mixed results, most of which are unfavorable. PTFE bicuspid pulmonary valve has shown some promising results. Few observational series have shown significant decrease in PR over short-to-medium term when PTFE bicuspid pulmonary valve was incorporated during repair of TOF resulting in better outcome. We aimed to study the short-term effects of PTFE bicuspid pulmonary valve when used during the repair of TOF with emphasis on early postoperative course and development of PR over short-term period. Approval for the study was obtained from the institutional ethical committee. Consecutive patients who underwent intracardiac repair with TAP and RV outflow tract (RVOT) reconstruction using PTFE bicuspid valve in TOF were included in the study after obtaining informed consent. Patients with absent pulmonary valve, branch pulmonary artery stenosis, residual ventricular septal defect, sepsis, and additional metabolic diseases were excluded from the study. Patients were included prospectively from December 2015 to December 2016, as well as retrospectively who have been operated at the center, meeting all the requirements for study within last 3 years. For retrospectively enrolled patients, data were collected from hospital records. The anonymity of the patients was maintained during the recruitment and analysis. Clinical and echocardiographic evaluation of the patients was done before surgical repair. Postoperative inhospital assessment included postoperative course, inotrope requirement, ventilatory support requirement, complications, mortality, and duration of hospital stay. Postoperatively, clinical and echocardiographic follow-up was done at 1 week, 3 months, and 6 months intervals. In all follow-up visits, clinical status and echocardiographic evaluation were done. Postoperative echocardiographic parameters primarily stressed on the status of prosthetic pulmonary valve, RVOT gradient, and degree of PR. Echocardiographic parameters for PR were based on recommendations given by the European Association of Echocardiography and included PR jet width compared to pulmonary annulus, color flow PR jet width, jet density and deceleration rate-continuous wave, pulmonary systolic flow compared to systemic flow-pulse wave, jet width/RV outflow diameter, diastolic flow reversal, regurgitation fraction, PR index, pulmonary valve, and RV size. Standard steps of CPB for intracardiac repair are performed. 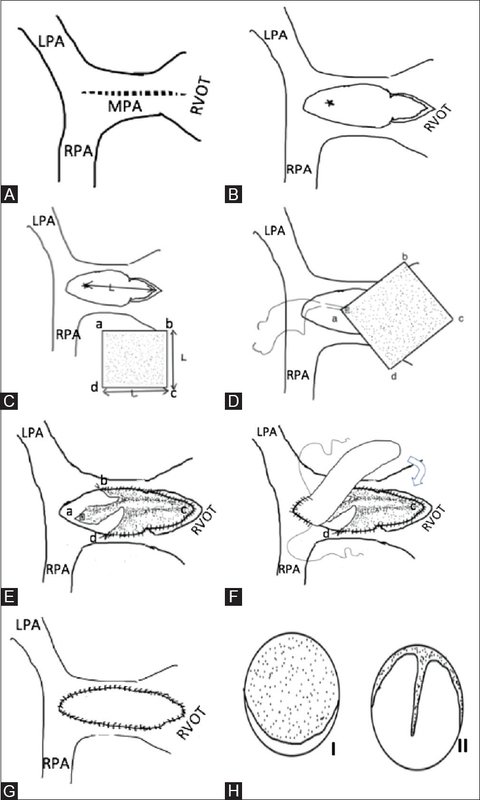 Once decision for performing transannular incision is confirmed, the following steps are undertaken to insert a PTFE bicuspid pulmonary valve [Figure 1] and [Figure 2]. This is overlaid with a liberal untreated autologous pericardial TAP which is sized in such a way that it will comprise two-third of the reconstituted circumference of the pulmonary annulus and MPA using 6-0 polypropylene continuously [Figure 1]F and [Figure 1]G.
Analysis was performed using the IBM SPSS (version 20.0, Armonk, New York, USA) software. Continuous variables are presented as mean ± standard deviation, and significance of association analyzed with paired t-test. Categorical variables are presented as percentages and significance of association analyzed with Fisher's exact test. P = 0.05 or lower was considered statistically significant. During the study period, 47 patients underwent intracardiac repair of TOF with TAP and PTFE bicuspid valve reconstruction of RVOT. After exclusion, a total of 38 patients were enrolled in the study. Six patients were excluded due to absent pulmonary valve, and one patient each due to associated tracheal stenosis, post-TOF repair Blalock– Taussig shunt due to persistent cyanosis and lost to follow-up. Male preponderance was noted in the present study population. Ten patients had previously undergone shunt surgery before the intracardiac repair and six patients had undergone preoperative major aortopulmonary collaterals coil embolization [Table 1]. Out of 38 patients, 31 (81.58%) patients were extubated in operating room itself [Table 2]. Inhospital course of these patients was studied for the duration of ventilatory support, inotropic support, hospital stay, and complications [Table 3] and [Table 4]. There was one mortality in first postoperative month due to complete heart block (CHB) for which permanent pacemaker implantation was strongly advised. 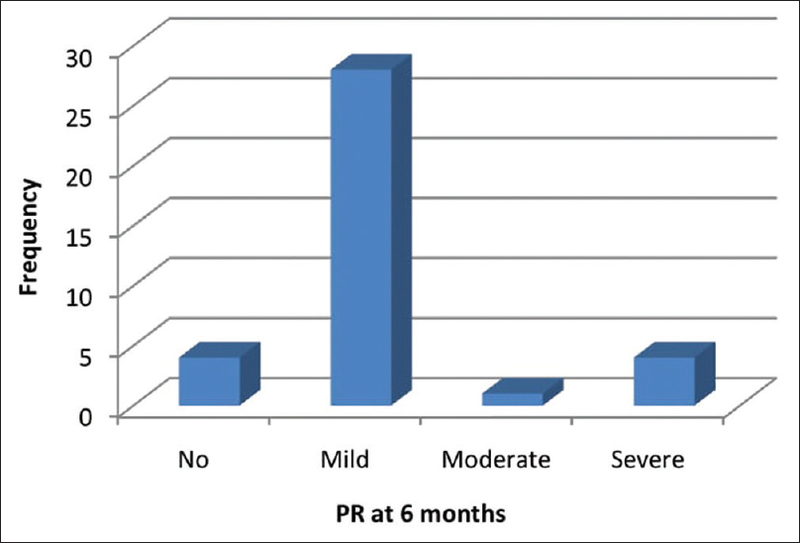 Out of 37 live patients at 6 months, most of them had mild or no PR; 4 had no PR, 28 had mild PR, 1 had moderate, and 4 had severe PR [Figure 3]. We compared the results of this study with other recent studies which used only TAP application. Our data were compared to study done by Ismail et al. where no valve was used. As there was significant difference in age between two groups, variables between two groups were compared with age-matched controls [Table 5] and [Table 6]. Average CPB time was significantly higher in the present study (mean: 104 ± 32 min vs. 185.60 ± 34.65 min; P ≤ 0.001). Compared to Egbe et al. who studied outcomes in 97 infants undergone TOF repair. TAP was applied in 60% of patients. Patients were divided in two groups according to the era of study, i.e., early (2001–2006) and late (2007–2012). The present study was compared with both the groups [Table 7]. The present study data were compared with Bigras et al. where no valve was used [Table 8]. Very few studies have been published about use of PTFE bicuspid pulmonary valve during TOF repair. To assess early outcome after the use of PTFE bicuspid pulmonary valve, we reviewed single-center experience and compared the results with the previously published studies in which only TAP was used without any valve. In the present study, mean aortic cross-clamp time was 66.55 ± 14.04 min and CPB time was 187.11 ± 32.97 min. CPB time was significantly higher in the present study compared to other studies. In the present study, 81.58% of patients were extubated in operating room itself. Compared to Egbe et al. number of patients extubated in operating room was significantly higher (early Group – n = 9 [17%] vs. n = 31 [81.58%], P ≤ 0.001; late Group – n = 17 [38%] vs. n = 31 [81.58%]; P ≤ 0.001). Invasive ventilatory support itself is the important factor for inhospital comorbidities. Although mortality was not different between two studies, duration of intensive care unit (ICU) stay and hospital stay was significantly lower in the present study indicating toward less postoperative comorbidities (discussed below). The reason for this difference might be much younger age group enrolled in Egbe et al. study. Duration of mechanical ventilatory support is one important factor related to in hospital comorbidities. In the present study, mean duration of invasive ventilatory support was 10.48 ± 24.22 h. Duration of mechanical ventilatory support was significantly lesser in the present study when compared with three other studies. As mentioned above, mortality was not statistically different, but ICU and hospital stay was significantly lower in the present study. Assessment of inotropic support was done with two variables, i.e., maximum number of inotropes used and duration of inotropic support. In the present study, mean number of inotropes used was1.31 ± 1.01 and mean duration of inotropic support was 54.26 ± 32.9 h. Mean number of inotropes used was significantly lower in the present study compared to Ismail et al., but duration of inotropic support was not significantly different. Egbe et al. also reported the duration of inotropic support which was not different from the present study. ICU stay and inhospital stay are the indicators of morbidity. Hospital stay more than 8 days was considered prolonged. In the present study, mean duration of ICU stay was 5 ± 2.56 days and duration of inhospital stay was 7.95 ± 3.08 days. Four patients (10.52%) had prolonged hospital stay. 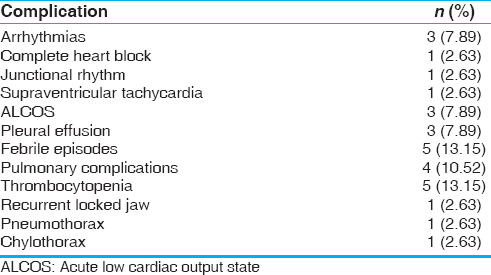 Reasons for prolonged stay were bradycardia secondary to AV dissociation in one patient, low cardiac output state in two patients, and persistent sinus tachycardia in one patient. Compared to Ismail et al., total hospital stay was less in the present study. Compared to Egbe et al. and Bigras et al., both ICU stay and total hospital stay were significantly less in the present study (P ≤ 0.05). In Ismail et al. and Egbe et al., patients were much younger compared to the present study whereas compared to Bigras et al., there was no significant age difference than the present study. Reported incidence of CHB in post-TOF repair patient is 2.5%–5.5%. Egbe et al. in a study of 97 patients reported 1% incidence of CHB. Incidence of junctional rhythm was reported to be 7.9% in a study of 101 patients done by Hashemzadeh et al. 13 patients (7.8%) in the present study reported arrhythmias. One patient had CHB, one patient developed junctional tachycardia, and one developed supraventricular tachycardia. Five patients developed febrile episodes, four patients had pulmonary complications, and three patients developed acute low cardiac output state. Five patients developed thrombocytopenia out of which only one patient needed platelet transfusion. Three patients developed pleural effusion that required prolonged pleural drainage (more than 5 days). One patient had unusual complication of recurrent locked jaw, one had pneumothorax, and one had chylothorax. All complications were managed conservatively. All 37 live patients at 6-month follow-up were asymptomatic. Mean RVOT gradient was not hemodynamically significant (18.8 ± 8.1 mmHg). Other studies using monocuspid valves such as Ismail et al. and Sasikumar et al. reported RVOT gradient in the same range. In the present study, PR was seen in 33 patients. Twenty-eight (75%) had mild, one (2.7%) had moderate, and 4 (10.8%) patients had severe PR. The major positive outcome of this study compared to previous studies is significant decrease in morbidity parameters in the form of decreased ventilatory support, decreased ICU stay, and decreased overall hospital stay. Decrease ventilatory support is probably the reflection of significant increase in extubation in operating room itself. Extubation in operating room may be the result of improved anesthesia care, intensive care measures, and surgical technique. Use of PTFE bicuspid pulmonary valve decreased the torrential PR that develops after TAP preventing sudden hemodynamic conversion of an obstructed, pressure loaded right ventricle to a volume-loaded right ventricle. This subsequently decreased the risk of right heart failure and subsequent risk of comorbidities including reduced hospital stay. The present study reported zero intrahospital surgical mortality. Although one patient expired within first postoperative month due to CHB, this patient had been advised to undergo permanent pacemaker implantation. Knott-Craig et al. reported a decrease in surgical mortality after primary repair of TOF in all ages from 11% before 1990 to 2.1% after 1990. Two additional series by Reddy et al. and Touati et al. reported similar low mortality rate of 1%–3% after primary repair with tendency for slightly higher mortality rates in neonates., Number of patients in present study is too small to reach any reasonable inference. The present study excluded patients with absent pulmonary valve which were included in studies by Reddy et al. and Touati et al. The anatomic complexity of their patient population must have contributed significantly to the slightly higher mortality in their study group compared to ours. Egbe et al. also reported zero operative mortality which also excluded patient population with absent pulmonary valve and pulmonary atresia. Like present study, Egbe et al. reported one patient undergoing pacemaker implantation in early postoperative period. This study carries the inherent limitations of an observational study regarding its susceptibility to bias and confounding, restricting their ability to define causality. Comparison of the present study has been done with other studies from other centers. Different centers have different overall conditions including experience and infrastructure, so comparative results of this study might not draw very precise conclusions. Adding a PTFE bicuspid valve technique did show additional benefit over the classical TAP technique. The short-term outcome of patients with TOF repair with PTFE bicuspid pulmonary valve is excellent, and it leads to marked decrease in morbidity. In the present study, more number of patients could be extubated in operating room; average ventilatory time was reduced subsequently reducing the hospital stay and overall treatment cost. Long-term follow-up is needed to assess the outcome of PTFE bicuspid pulmonary valve in intracardiac repair of TOF with respect to the development of pulmonary stenosis and PR. Hashemzadeh K, Hashemzadeh S. Early and late results of total correction of tetralogy of Fallot. Acta Med Iran 2010;48:117-22. Egbe AC, Mittnacht AJ, Nguyen K, Joashi U. Risk factors for morbidity in infants undergoing tetralogy of Fallot repair. Ann Pediatr Cardiol 2014;7:13-8. Sarris GE, Comas JV, Tobota Z, Maruszewski B. Results of reparative surgery for tetralogy of Fallot: Data from the European Association for Cardio-Thoracic Surgery Congenital Database. Eur J Cardiothorac Surg 2012;42:766-74. Kirklin JW, Blackstone EH, Kirklin JK, Pacifico AD, Aramendi J, Bargeron LM Jr. Surgical results and protocols in the spectrum of tetralogy of Fallot. Ann Surg 1983;198:251-65. Bouzas B, Kilner PJ, Gatzoulis MA. Pulmonary regurgitation: Not a benign lesion. Eur Heart J 2005;26:433-9. Zhao HX, Miller DC, Reitz BA, Shumway NE. Surgical repair of tetralogy of Fallot. Long-term follow-up with particular emphasis on late death and reoperation. J Thorac Cardiovasc Surg 1985;89:204-20. Murphy JG, Gersh BJ, Mair DD, Fuster V, McGoon MD, Ilstrup DM, et al. Long-term outcome in patients undergoing surgical repair of tetralogy of Fallot. N Engl J Med 1993;329:593-9. Jonsson H, Ivert T. Survival and clinical results up to 26 years after repair of tetralogy of Fallot. Scand J Thorac Cardiovasc Surg 1995;29:43-51. Nollert G, Fischlein T, Bouterwek S, Böhmer C, Klinner W, Reichart B. Long-term survival in patients with repair of tetralogy of Fallot: 36-year follow-up of 490 survivors of the first year after surgical repair. J Am Coll Cardiol 1997;30:1374-83. Greutmann M, Tobler D. Changing epidemiology and mortality in adult congenital heart disease: Looking into the future. Future Cardiol 2012;8:171-7. Sasikumar D, Sasidharan B, Tharakan JA, Dharan BS, Mathew T, Karunakaran J, et al. Early and 1-year outcome and predictors of adverse outcome following monocusp pulmonary valve reconstruction for patients with tetralogy of Fallot: A prospective observational study. Ann Pediatr Cardiol 2014;7:5-12. 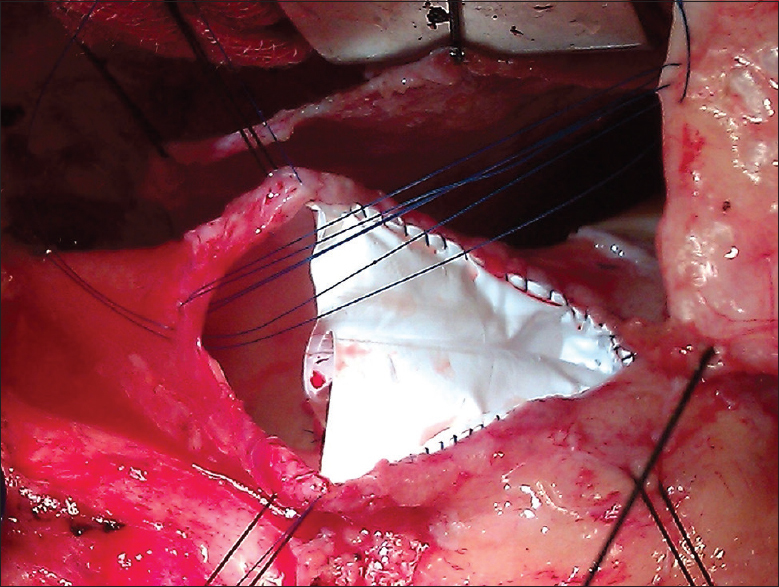 Nunn GR, Bennetts J, Onikul E. Durability of hand-sewn valves in the right ventricular outlet. J Thorac Cardiovasc Surg 2008;136:290-6. Ismail SR, Kabbani MS, Najm HK, Abusuliman RM, Elbarbary M. Early outcome of tetralogy of Fallot repair in the current era of management. J Saudi Heart Assoc 2010;22:55-9. Bigras JL, Boutin C, McCrindle BW, Rebeyka IM. Short-term effect of monocuspid valves on pulmonary insufficiency and clinical outcome after surgical repair of tetralogy of Fallot. J Thorac Cardiovasc Surg 1996;112:33-7. Knott-Craig CJ, Elkins RC, Lane MM, Holz J, McCue C, Ward KE. A 26-year experience with surgical management of tetralogy of Fallot: Risk analysis for mortality or late reintervention. Ann Thorac Surg 1998;66:506-11. Reddy VM, Liddicoat JR, McElhinney DB, Brook MM, Stanger P, Hanley FL. Routine primary repair of tetralogy of Fallot in neonates and infants less than three months of age. Ann Thorac Surg 1995;60:S592-6. Touati GD, Vouhé PR, Amodeo A, Pouard P, Mauriat P, Leca F, et al. Primary repair of tetralogy of Fallot in infancy. J Thorac Cardiovasc Surg 1990;99:396-402.